» Hope Chest for Breast Cancer - A Local Charity We're Proud To Support! » Norm's First Annual Alzheimer's Ride. And Bandanas to Match! » Happy Go Brazen Customers Share! Shopping can be FUN on www.GoBrazen.com! This holiday giving season, we've made gift giving simple, personalized and fun. Check out our awesome gift sets!! We've given you a head start by creating a few. Let your imagination run wild, we'll help you create a great gift set for your budget and your sweetie's taste and personality. Just contact Val@GoBrazen.com if you'd like help shopping, gift wrapping or creating a gift combo. If you'd like to surprise your special someone, or let them be involved in the creation of their own special gift set, gift certificates are the perfect gift! One size fits all, and they are easy to buy online. Remember, through November 30 we have free shipping on all orders over $75. Click HERE to shop online for those Black Friday - Small Business Saturday - Cyber Monday deals now through the end of this month! Happy Holidays from Everyone At Go Brazen! Hope Chest for Breast Cancer - A Local Charity We're Proud To Support! Norm's First Annual Alzheimer's Ride. And Bandanas to Match! Happy Go Brazen Customers Share! See the smiles on our Go Brazen Bombshells! They are showing off their latest bandanas, tops and bling. Beauties, one and all!Click HERE to see the video. Do you have a picture to share? Email Valerie, or send via our Facebook page.Thanks to all who shared. Keep those beautiful smiles coming! 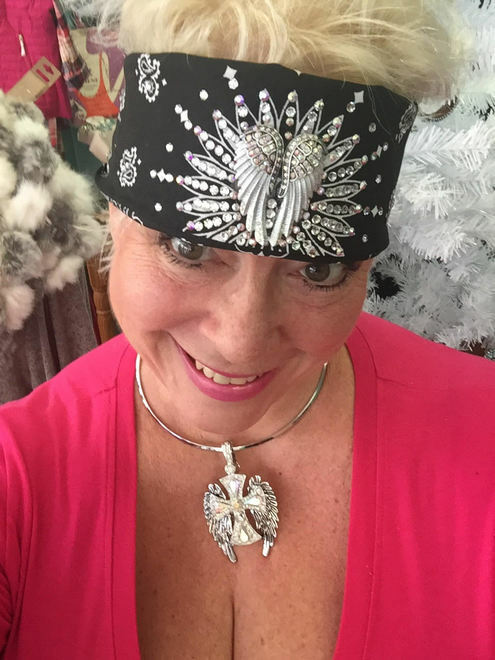 Bandanas - Unique, Useful and Full of Go Brazen Bling! Go Brazen Grand Opening. Free Shipping. Oh, and We Were On TV! What Do You Wear With a Bandana? A Smile!